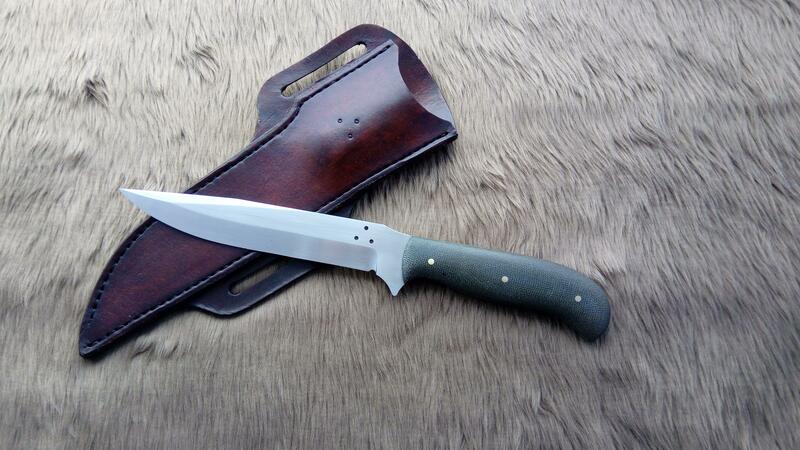 There was also a J T Ranger completed with a OD canvas micarata handle on the 5 1/2 inch 1095 blade. They all turned out great. My favorite of them is the dagger. I can't wait to see your version of the Fairburn-Sykes. That is my favorite!!! That was strapped to the inside of my right leg for many years. 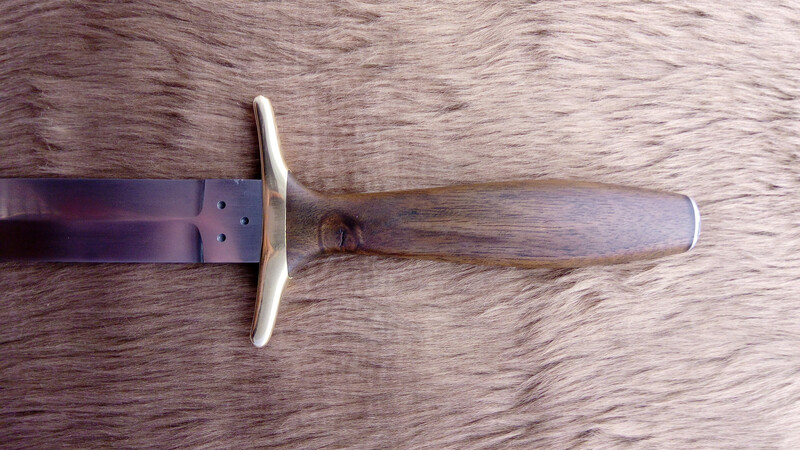 The dagger shown is, as I said, very loosely based on the Fairburn-Sykes and was not intended to be a copy as such. Really liking that work Gruff. 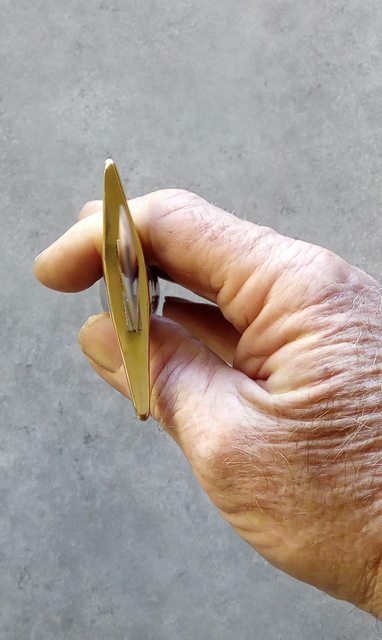 Did you free hand the grind or use a jig? Would love to see how you did that - beautiful work. Hey Guff. 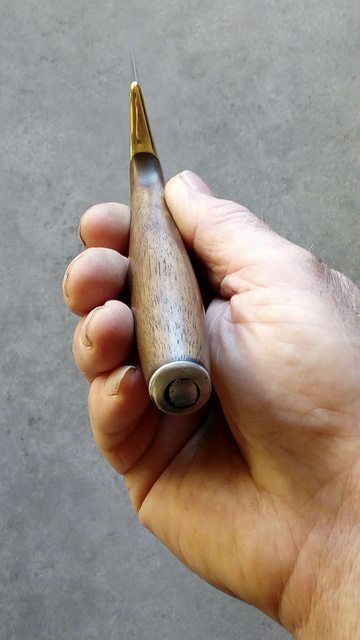 If you have a pic of the tang peened to the pommel I'd love to see that. 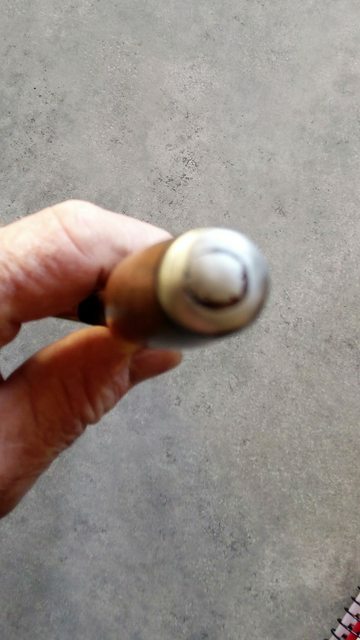 When you heated up the tang how did you keep from cooking the handle. 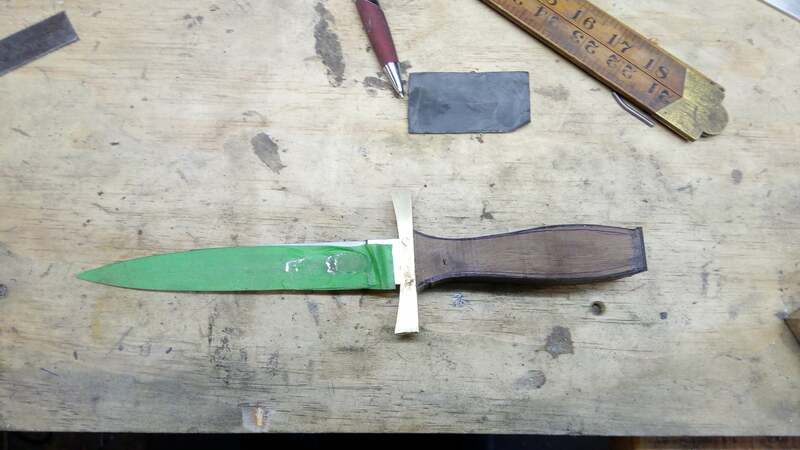 That dagger is simple, lovely, and dangerous looking. Absolutely delightful!! Well done. I used a jig to do the grinding OP.For me anyway, that takes the risk of having to bin too many blades way down to the exceptable level. Garry...you gonna start making those? You did a fine job!! I had a "put my name on one of those" within minutes of showing it on my FB page but I may just sell him this one and let it go at that. 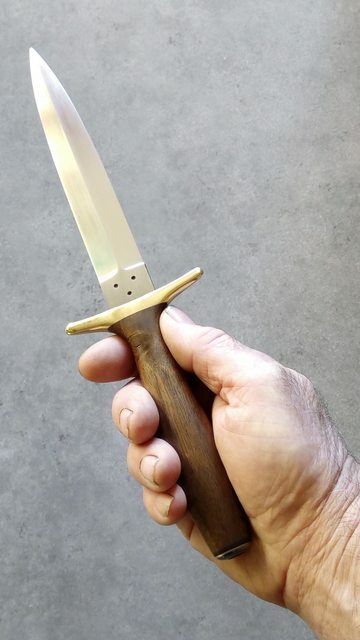 The dagger only has one purpose and I am not sure I want to be facilitating that or the intent or even the thought behind them. I had always wanted to test whether I could actually make one that was the impetus for this one so dont intend to repeat the process. 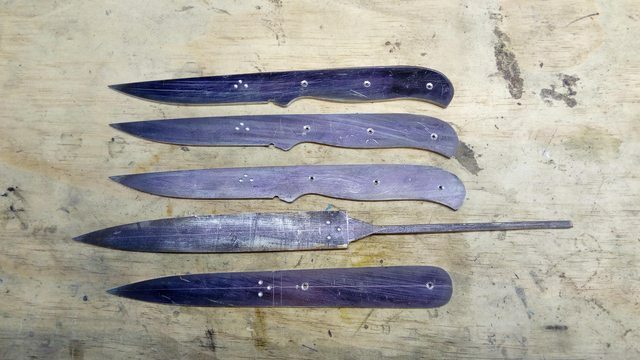 I am primarily a hunting knife maker but the chef and table knives do seem to have taken a larger part of my order book than I ever thought they would as again it was to test whether I could make a decent one that bought about me doing them originally. I suppose I just enjoy the challenge of trying something new. 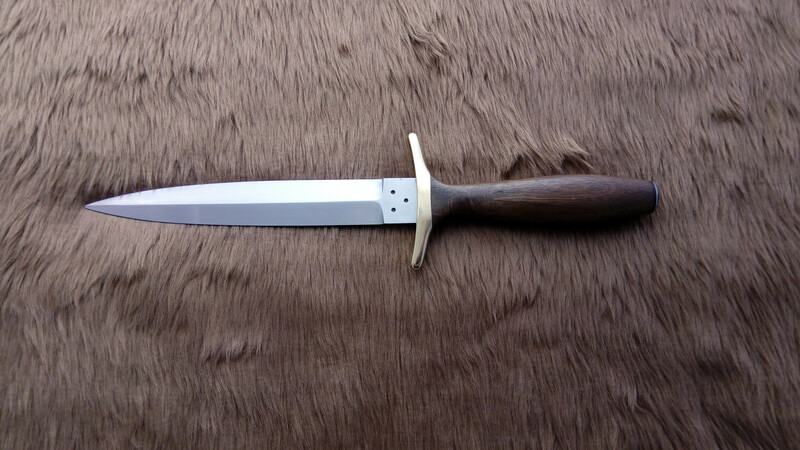 The dagger only has one purpose and I am not sure I want to be facilitating that or the intent or even the thought behind them. Your right. With that, not everyone that buys a dagger will want it for that reason. There is a group of people called collectors. Yes I understand that and the guy who has ordered it is ex mil and a collector who owns one of the gunshops that carries my knives so I have no qualms about him having it.